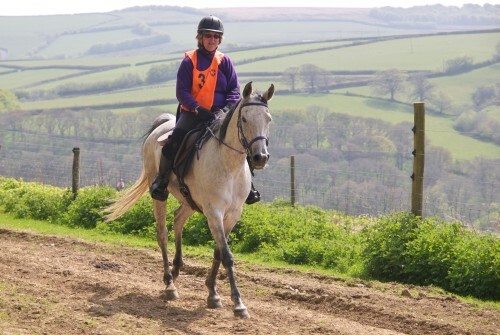 The Exmoor National Park is the perfect place for riding - hacking, trekking or hunting. Within the National Park boundaries are some 400 miles (600kms) of bridleways. The Exmoor National Park Authority has a special responsibility to ensure that all bridleways within its boundary are open and useable and that every path is signed where it leaves or joins a public highway. The more popular bridleways are waymarked using the national colour code of blue. Some Exmoor accommodation providers also provide some form of livery and some riders bring their own horses with them on holiday. Horses can also be hired by the hour, day week etc. You can ride from B&B to B&B with your luggage transferred for you: Ask the accommodation owner for details - see below. The Exmoor Golden Horseshoe endurance ride takes place in May every year. Centre of operations is a field 1mile N of Comers Gate, south of Exford (map). The event attracts riders from all over the UK and is classed as one of the toughest endurance riding venues in Europe. Book accommodation early - this is an extremely popular event with participants and spectators. See our photos of 2010 event. Tawstock Quality Bed and Breakfast in 18th Century Devon Farmhouse. Hollamoor Farm offer horse and rider bed and breakfast at their 18th Century Devon Farmhouse which is situated in Tawstock, Barnstaple, among 400 beautiful acres of beautiful scenery, with hardly a gate to open. Hollamoor Farm benefits from open fields, farm tracks, woods, lakes and hills all around, and is a short drive from Saunton Sands Beach and the Exmoor National Park. Facilities include large stables, paddocks, all weather arena, lockable tack room, ample parking etc..
Dulverton Quality Bed and Breakfast in 14th Century Farmhouse. Horse accommodation and horse transport facilities. Dulverton Riding holidays and hourly rides for adults and/or children. All rides escorted. B&B in cottage accommodation. Inclusive Short breaks or weeks with riding holiday packages. Virtually no road work. Ride on the moors, forests and coombes. Rides from 1 hour to day long stopping for lunch at an inn. We also have Self Catering Cottages sleeping 2-8. Our new website has lots of details and photos. Allerford, nr Porlock 5 Holiday Apartments around a lovely courtyard in the National Trust village of Allerford near Porlock. 3 and 4 star VisitBritain. Sleep 1-5. Next to the famous Pack Horse bridge over the river Aller. Stable and tack room available. Location Keith and Sally Wade, Liscombe Farm, Tarr Steps, Dulverton. Location Lynton, N Devon. EX35 6JR. On A39 between Barbrook and Parracombe. Location West Anstey, Dulverton, Somerset.